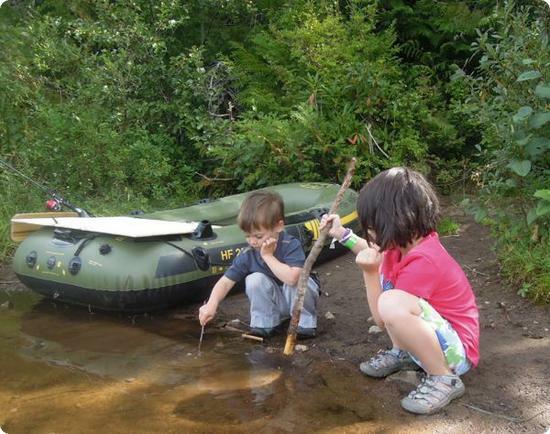 This time of year my email is filled with news about the latest travel-related gifts and travel toys, so it's helpful for me to remind myself that all the kids really need is a good stick, some water, and permission to get themselves dirty or wet. Post a travel photo on your site. It can be about any topic, as long as it is G-rated. The focus of the post should be on your photo. You don't need to be a professional photographer (I'm not), but do showcase your best work, and make it big enough to see well! It's nice to include a few sentences about the photo, but it is not required. Link back here so that your readers can see all the other great Photo Friday posts. Tracy Burns on October 11, 2012 at 6:14 p.m.
Oh the joy of sticks and a source of water. It's amazing how entertaining sticks can be! Add in an empty water bottle, some leaves and dirt ... hours of fun. And lets not forget rocks. My kids can never collect enough rocks. We travelled around Europe with a skittles box full of rocks. Everywhere we go we end up coming home with pockets full of them. This week the kids discovered that their gold and silver crayons could turn plain old rocks into rather convincing gold and silver nuggets. Since then they've been collecting even more rocks than usual to make nuggets to trick Mum and Dad with. Beth from Cloud Surfing Kids on October 11, 2012 at 7:29 p.m. Such a good thing to remember. Parenting can be so overwhelming at times. It's easy to forget the little things that can bring our children joy don't always have to be purchased. Keryn @ Walking on Travels on October 12, 2012 at 3:03 a.m.
Yup. All my boy needs is a few rocks and a good stick to have the best time. Throw in a walk by some construction equipment (like we did in San Marino yesterday) and it is the best trip of his life! Steve on October 12, 2012 at 9:33 a.m. Sticks and water are probably the best toys, but it looks like there's a bit of an arms race brewing there. One stick is definitely bigger than the other. Kate on October 12, 2012 at 10:47 a.m.
Duke on October 13, 2012 at 3:07 a.m.
Sandra Foyt on October 13, 2012 at 6:22 a.m.
Ha! Reminds me of Wired Magazine's GeekDad article on "The Five Best Toys of All Time." The best toys are those run by imagination, no? Debbie on October 13, 2012 at 8:46 p.m.
randy sanders on October 17, 2012 at 1:16 p.m. I'm Debbie, mother of three delicious kids and I write about traveling with little kids. That's my daughter in the backpack and my son in Paris on Halloween.